We are talking today with Kirby Overby, general manager of Tommy Bynum Heating & Air. 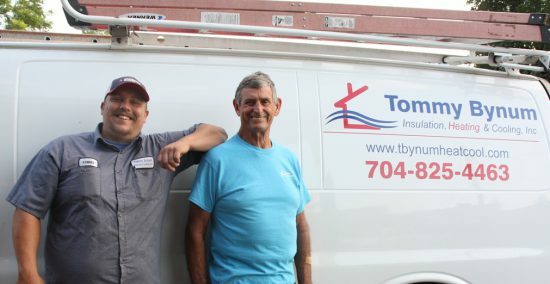 Kirby: Tommy Bynum Heating & Cooling has been providing comfort to the people of Belmont and Gaston County for over 40 years!We are looking forward to continuing to provide outstanding service at a fair price to the people of Belmont and Gaston County! GA: Why were Southern Comfort and Tommy Bynum such a good fit? Kirby: Mr. Bynum is a devoted Christian, as are both of the owners of Southern Comfort. As a result, both companies share common core values. Following the golden rule in business means treating our customers, employees and the community like we want to be treated – with integrity, respect and humility. GA: If I am new to the area or considering changing heating and air companies, why should I consider Tommy Bynum Heating and Air? Kirby: Trust. Our industry, like a lot of others, has a few bad apples. Unfortunately, those bad apples are starting to taint all of us with a bad reputation. Our goal is to treat customers according to the golden rule. In other words, treat them like we want to be treated. That means delivering good service, on time, at a fair price. Buy local. Our company is based right here in Belmont. Our owners and most of our employees live in Gaston County. Their kids go to school here. They attend churches in Gastonia, Belmont, Mt. Holly, Cramerton, Dallas and other local communities. Why not give your neighbors a chance to earn your business and keep those dollars here in Gaston County? GA: What are some things to consider when choosing a heating and air company? Kirby: Can I trust them? Will they be here to honor the warranty on my new equipment purchase (Tommy Bynum and Southern Comfort combined have over 100 years of experience in this market). Will they treat me fairly and honestly? (We will never over charge people for work that isn’t done and will never try to sell you something you don’t need). Are their prices fair? Our prices are very competitive, like any type of service you can always find someone who will do it cheaper, but are they licensed and bonded, do they carry the proper insurance, will they be in business a year from now? We will be around to honor your warranty and provide you with worry free comfort for years to come, and we feel that we offer a better value than the bigger Charlotte or Gastonia based companies advertising in this market. GA: I see service or tune up contracts offered- are they really worth the money? Kirby: Would you buy a new car and then never get the oil changed? Well your HVAC systems are probably the next most expensive mechanical investment most consumers will ever make, besides their car. So why wouldn’t you make a relatively small investment to keep it running at peak efficiency, and to help prolong its life? Industry studies have proven that properly maintained HVAC equipment will: 1. Run more efficiently saving energy costs; 2. Breakdown less frequently saving repair costs; and 3. Last longer saving on eventual replacement costs. GA: What if I am building a new house-do you do new construction? Kirby: We do. We also can help design system retrofits if you are doing a home improvement project or addition, or if your duct work or system are aging and need to be improved or upgraded. GA: Are their advances in heating and air systems? How efficient are some of the new systems? Kirby: There have been many advances over the years with energy efficiency just being part of it. Variable capacity systems, enhanced humidity control along with indoor air quality products allow us to design a system to keep your home more comfortable as well as healthier. GA: How do I get started with you guys? Kirby: Just give us a call at 704-825-4463!